Winning designs in the third annual AccuQuilt Barn Quilt Contest will be displayed on AccuQuilt’s Omaha headquarters building. Winners will be announced by Ricky Tims at the AQS-Paducah quilt show in April. We can hardly wait to see all the entries and get together with our quilting friends for another year’s festivities. AccuQuilt, international distributor of fabric cutting solutions for quilting and fabric crafts, announced the launch of the third annual AccuQuilt Barn Quilt Contest, kicking off on March 16, 2012, during National Quilting Weekend. The company invited quilters, fabric artists and designers from any discipline to enter designs at accuquilt.com/barnquilt by April 9, 2012. Winning designs will be enlarged and displayed as exterior decorations on AccuQuilt’s headquarters building in Omaha, Nebraska. Tens of thousands of cars are expected to drive by the building on a daily basis during 2012, where they will see the designs in full view. The Top 100 entries will be posted on the company’s website, where consumers will be invited to vote on their favorite designs from April 11 through April 18. Winners will be announced by quilting personality Ricky Tims at the American Quilter’s Society’s AQS Paducah Quilt Show on Friday, April 27. The winning barn quilt design will be turned into a 17-foot painted barn quilt design, and the designer will receive a $1,000 shopping spree for AccuQuilt product, a trip for two to a special unveiling event in Omaha on June 22, and two tickets to one of the company’s two June Let’s GO! Quilt Retreats. The two-day retreats, sponsored by AccuQuilt and Country Traditions, will take place immediately before and after the unveiling. The retreats and unveiling event were timed to coincide with the Omaha Quilt Show, which is taking place right next door at the same time. The design created by the runner up will be transformed into a six-foot barn quilt, and the designer will receive a $250 AccuQuilt shopping spree and one ticket to a June AccuQuilt retreat. In addition, designers of the top 100 quilt block designs will receive $25 in AccuQuilt Rewards Points. “We can hardly wait to see all the entries and get together with our quilting friends for another year’s festivities,” said AccuQuilt CEO Steve Nabity. “We’ve found that the contest and retreats present a fabulous opportunity for all of us to show support for this great American pastime and discover new ways to enjoy it. At AccuQuilt, these events give us a perfect forum for listening to what quilters really want and need.” The second June 2012 retreat is being advertised as a reunion for past attendees of AccuQuilt retreats, as well as new AccuQuilt friends. According to American Barn Quilts (americanbarnquilts.com), painted barn quilt designs became an American tradition more than 300 years ago when immigrants began to arrive from central Europe. During the early 20th Century, barn quilts were replaced in many places by advertisements. In 2001, Donna Sue Groves of Adams County, Ohio, painted a colorful quilt block on her barn as a way to honor her mother’s love of quilting. Her creative painted quilt began a new generation of barn quilt blocks. She encouraged others to paint quilt blocks on their barns, and today more than 3,500 designs have been documented. The collection is known as the National Barn Quilt Trail. It covers 30 states and two Canadian provinces. Complete contest details are available at http://www.accuquilt.com/barnquilt. The AccuQuilt GO! 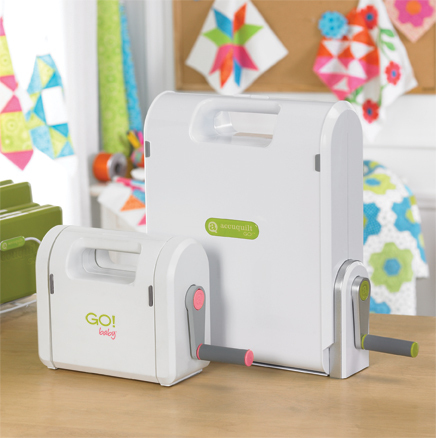 Baby® Fabric Cutter and GO!® Fabric Cutter, are available at local quilt and fabric retailers. Quilters also can purchase GO! fabric cutters and dies, along with the Studio™ Fabric Cutter, GO! adapters, and hundreds of Studio™ quilting dies, by visiting accuquilt.com or calling 888.258.7913. AccuQuilt makes fabric cutters that are used by quilters and fabric crafters to cut fabric quicker and get to the fun part of quilts and crafts sooner. 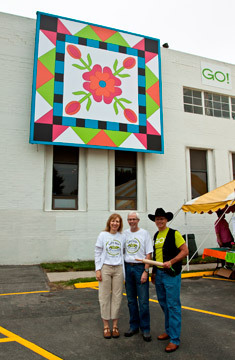 In 2011, AccuQuilt’s winning barn quilt design was created by Candace Door.